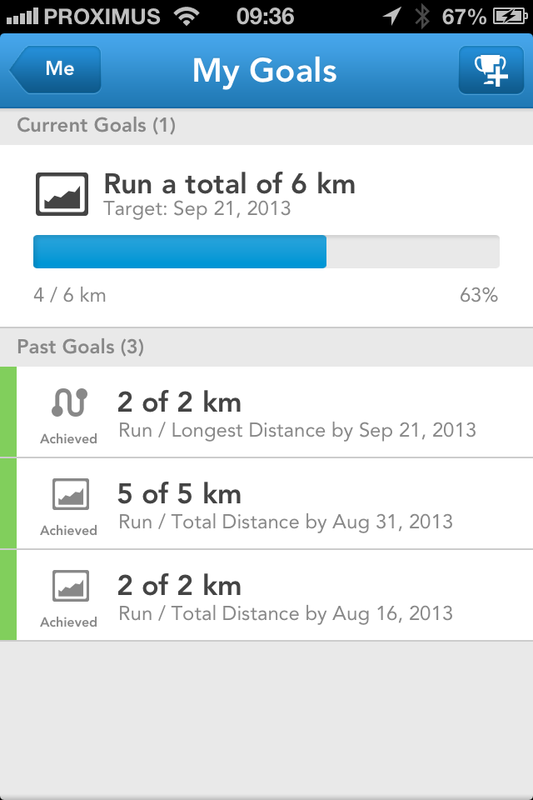 A few months ago RunKeeper implemented goalsetting in their application. What I like about is of course the different options to set goals. Especially the tiny incremental goalssetting possibilities and the immediate feedback you get accordingly. My routine for more then a year is to do a workout 3 times a week, if possible more, but 3 times a week for sure. I usually run 10 minutes – 10 minutes Tai Chi – another 10 minute run. So it is not a lot, it takes 30 minutes of my time, and it is easy to manage. 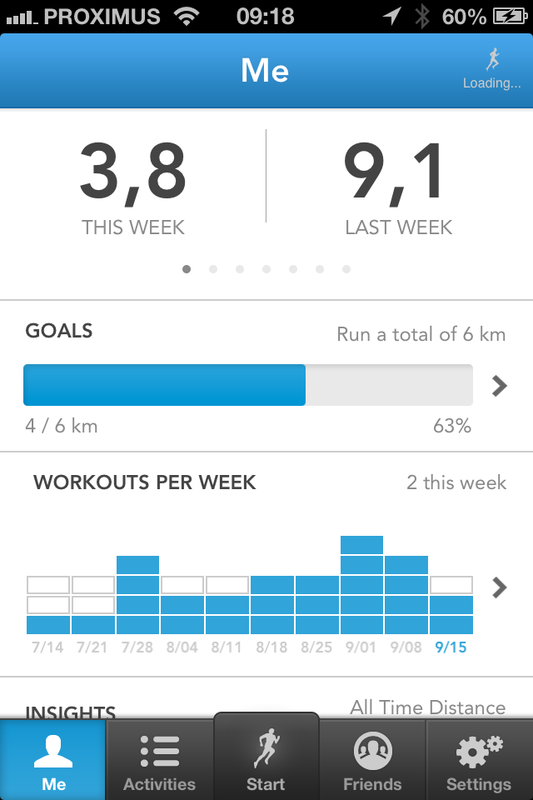 Since the RunKeeper update I tried different goals, but the one I really like ‘run total distance by x date. Every week I try to set another goal, just a tiny little bit higher then the previous one. So my end goal is to run 10 km a week. What the trigger is, is really simple, seeing the progress bar grow during the week in achieving my goal, this is great feedback! And after my run the awesome feeling when I get when I get immediatly the overview of what I achieved! Below the different screens that show me my evolution in reaching my goal! If you want to start working out, try this method to aim at a long term of behavior change. It will guide you smoothly towards your next goal. 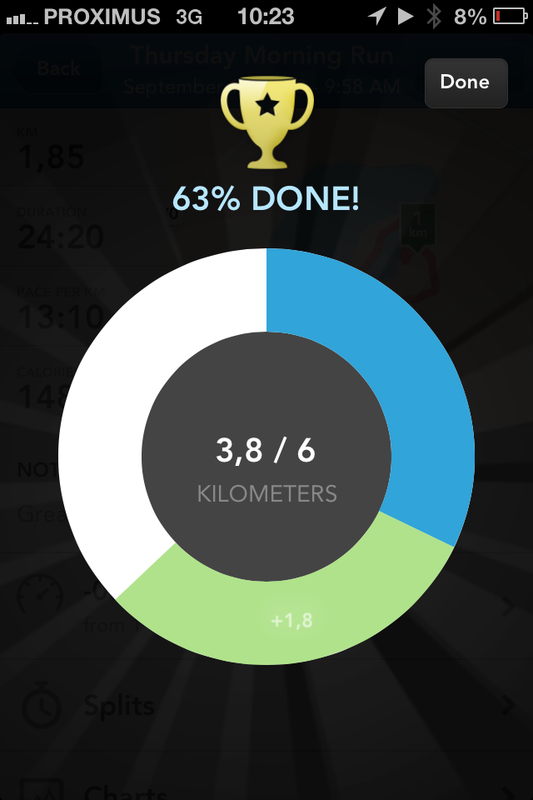 Progress screen immediately available after your workout is finished, gives the ‘Awesome’ feeling. Screen 3 where the different goals that are passed, aligned with dates. Time investment in Master New Media & Society in Europe. I thought it would be fun to track my study moments and writing about my research during the acadamic year 2012-2013, including the summer of 2013. Just to know how much time I would spent to finish and succeed. To see my Green Span Behavior over time. 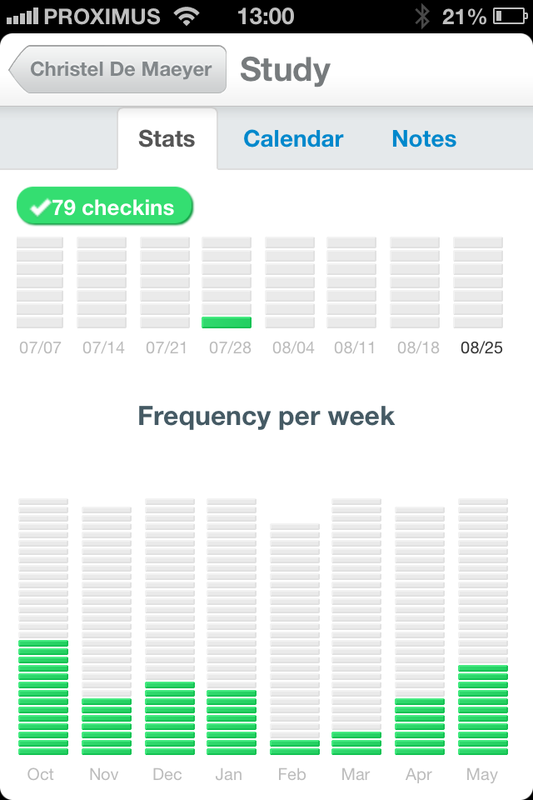 The study moments are mainly reading for my master thesis, there are 79 checkins starting October 2012. It is possible I forgot to check in, but I’m pretty rigid about it. So lets say that I studied an average of 4 hours per check in (there will be peaks here and there), that would be 316 hours 39,5 days, 1,3 month. The writing includes writing for my thesis, writing papers, writing articles concerning my research. In total 86 checkins. The habit says 30 minutes, but it is much more than that, usually around 4 hours writing a day.Also here I started tracking in October. 344 hours, 43 days, 1,5 month. In total 784 hours, is 98 days, 3,2 months on full time basis 8 hours a day. Spread over 9 months – one acadamic year. It is not finished yet, but almost! Thesis is in proofread, and with my promotor for a last review. So there will be some correction rounds and finetuning. When it is finished you will be able to read it here! There are some interesting findings in there on self-tracking, if you are interested in this area stay tuned! 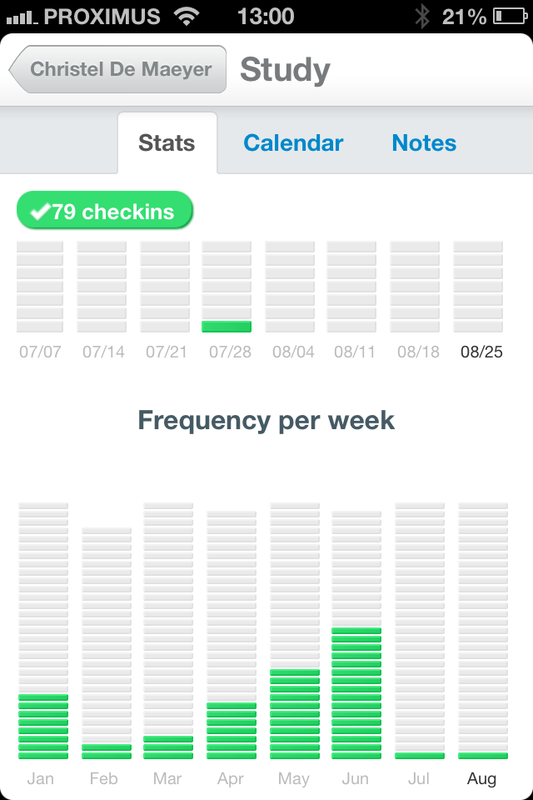 Screenshots Lift App, keeping track of habits. There is overlap, because it could not go in one screenshot.